Our shining cross photo frame is a wonderful way to display photos or place cards at your religious event. 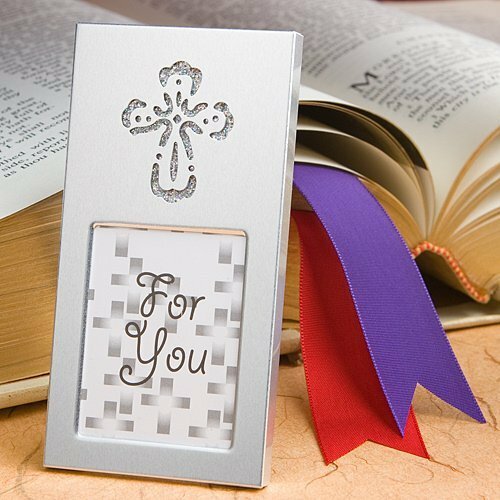 The 2" by 4" silver metal frame includes a 1 7/16" by 1 7/8" glass photo window and a shimmering cross cutout design. The black craft back includes an easel so each of these cross party favors can stand on it's own. The frames are packaged in a white box with a cross design "For You" insert. The photo recommended for this item is about 1 7/16" by 1 7/8" size.